WinSCP is a feature-rich tabbed file transfer client with a variety of views including single-window, dual-pane and tree view interfaces. The program supports standard FTP as well as secure connections using WebDav, S3, SSH, SSL/TLS and legacy SCP. The program can search, perform directory synchronization between local and remote, change properties, and edit text/binary files. Includes support for scripting, task automation, various authentication tools, proxy, SSH tunnels and IPv6. Alternatively, WinSCP Portable is multilingual and supports PuTTY Portable. X-WinSCP, packaged in winPenPack's format, is also available. 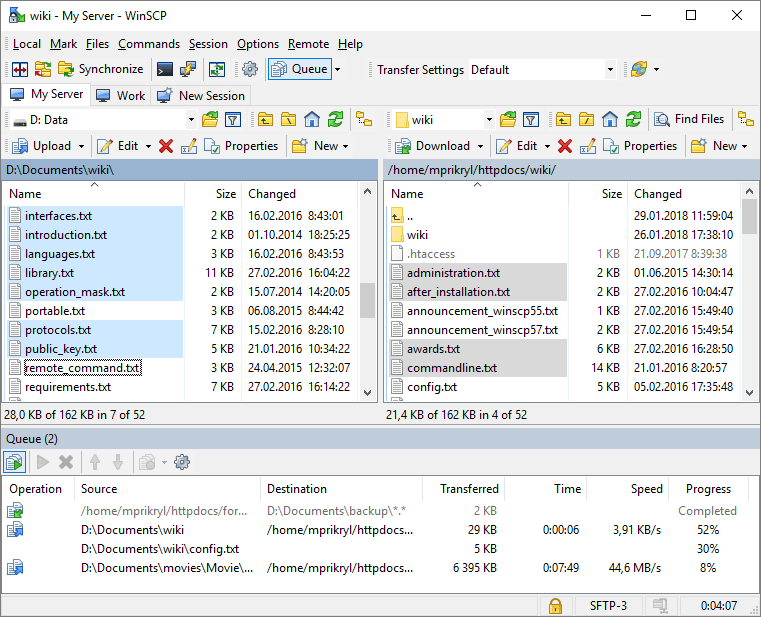 WinSCP 5.5.5 (5.5.5 Build 4605) has been just released. I've been a huge FileZilla fan since it came out back in 2001, but got a chance to test it today and WinSCP is amazing. I was able to resolve an issue with WebDAV via that program that no other program seemed capable of. FileZilla is a fast and reliable FTP client, including secure options SFTP and TLS. The program interface includes an easy-to-use tabbed window, drag-and-drop capability, bookmarks, remote and recursive file search, remote file editing and a managable upload/download queue. Internally, it supports connection throttling, keepalive, timeout detection, IPv6, SOCKS 4/5 and HTTP 1.1 proxy etc. Alternatively, Filezilla Portable is pre-configured as portable and automatically adjusts paths, as well as X-Filezilla. Cross-platform with clients available for Mac and Linux. For Windows XP, an older and unsupported version is available. "How to extract:" instructions should be redacted accordingly. Thanks for updating "How to extract". CarotDAV is a simple client for many remote file storage services including AmazonCloudDrive, Box, DropBox, GoogleDrive, HubiC, iCloud Drive, OneDrive, OpenStack Swift, SugarSync and as well as WebDAV, FTP and IMAP. Supports various view settings including detail, small/large icons, drag-and-drop interface, file transfer progress window (with speed listings) and a variety of sorting and grouping options. Allows for multiple instances to connect to multiple different services, but doesn't yet support transfers between them. Includes dynamic encryption and decryption, automatic file-splitting (e.g. OneDrive's 25 MB file size limit) and doesn't store passwords in plain text if a master password is set. How to extract: Download the "Portable Version" ZIP package and extract to a folder of your choice. Launch CarotDAV.exe. What's new? See Japanese changelog here. Ah - sorry - that wasn't the changelog - just the English for the main page. I would like to have it load OneDrive for Business instead of just regular OneDrive. @BGM: Yeah that would be a big help for me as well. I'm very confused about the material differences between the two services. Lord knows there's no real difference between free and paid versions of every other cloud storage service. i.Ftp is a small FTP client that supports dual-pane local/remote views, SOCKS proxy, resumable FTP/HTTP download and abortable transfers. Supports secure connections in both FTP over SSH and SSL. Can resume and schedule web (http) downloads like a basic download manager. Client available for Mac OS X. Note: this program has not been updated in some time and may be subject to security vulnerabilities, including Heartbleed. Fixed the refresh button not honouring the current item filter. Improved the filtering and listing of items to use hash tables instead of O(n) searching, which you won't notice on small folders but on 1000's of items it'll make a difference. i.FTP is indeed portable. it doesnt have the ability to see symbolic link directories on the remote server. it thinks they are files. its annoying that when you select port 22 that it doesnt auto-detect that its FTP over SSH. i cant use this piece of junk. FileZilla is way better. Very basic but you might want to add it to your collection. Filezilla can't handle certain public wifi setups whereas i.FPT can. I realize I'm pretty late with this comment, but I've discovered a couple of annoying bugs in version 2.21 (which I've reported to the author), and eliminated them by downgrading to 2.11. Otherwise this is a very nice FTP client; portable, nicely laid out, and easy on resources. Save2FTP is designed for an automatic online backup of your important data to remote FTP servers. It will help you organize your backups and schedule automatic backups. It supports inclusion and exclusion of files by wildcard mask as well as by exact file name, and keeps detailed logs of all backup operations. It includes a scheduler for unattended auto-backup and scheduling of any specific time or date, day of the week or month. It also allows you to create incremental backups so you only need to backup files that have changed. Note: The freeware version of Save2FTP no longer appears to be available. I have made available for direct download the most recent version. Thanks to MarcosJC for sending me V2.1. If you have anything newer, please email me directly. There is also a language pack for german and dutch. I tried 'german' with V2.5 and it worked fine. @Humbleside: Thanks for the official link to the freeware version. I downloaded and tried it. Although it says the version is "1.9", when you run the installer it says "2.1". And the version info in the EXE says "2.1.2.2042". So I will remove the direct download and point the links to the official ones. @Checker: Thanks for the link. However, as I am unable to verify the authenticity of the software (eg. is it a cracked version), I will continue to point to the official links supplied by Humbleside.